A little while ago I had a pizza party with some friends, it was a lot of fun. I also held a music event with free pizza a few months ago. so it's really a perfect fit to write about here! plus a little look at some other kinds of pizza. When talking about American pizza to Japanese people, the biggest things to freak out over are size and price. Essentially, sizes in Japan are graded one step above how they are in america. In other words, for example an American M-size pizza would be about an L in Japan. Additionally, you don't see S size pizzas in Japan too often, but a Japanese M is close to an S in American sizes. 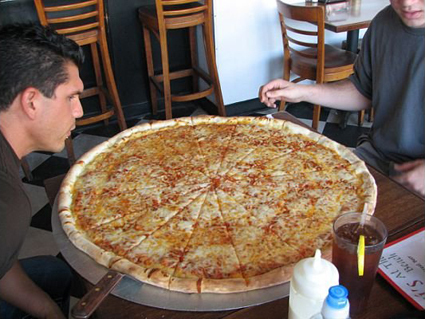 Probably most Americans looking at an M-size Japanese pizza would think it's enough for one person. こんなのも全然あり得るんです。 / Even this size isn't too strange. And despite the sizes in America being much bigger, the prices are also a lot lower. For the most part, pizza prices in America are about half that of those in Japan. That said, in America you do usually have to pay for delivery as well as tip. Even factoring that in, though, it's still fairly cheaper than Japan. like half off a pizza or buy one get one free. Aside from stuff like prices, there are also differences in the pizza itself! Lately there have been a lot of different crazy crust styles. 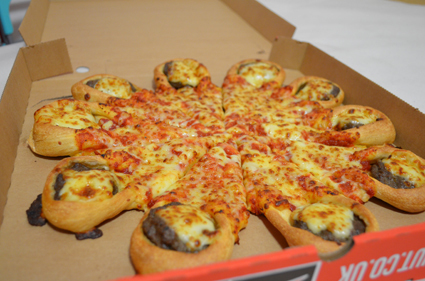 but now they're coming up with things like “cheeseburger crust” pizza which is crazy. There's also Chicago's famous deep-dish pizzas, and New York's huge slices! 真面目な話、こんなの思いつきます？ / Seriously, who came up with this? 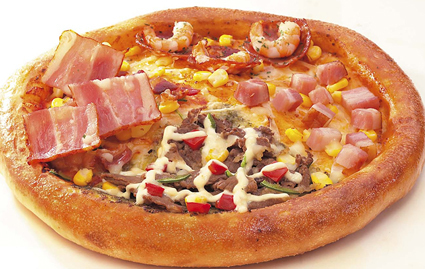 The main thing that usually freaks Americans out about Japanese pizza is the choice of toppings. 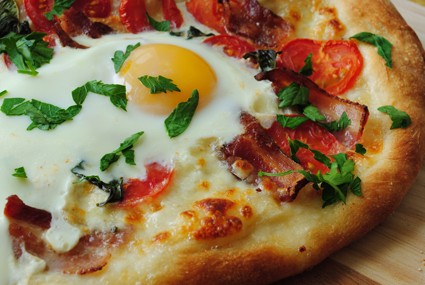 Things like corn, shrimp and eggs - stuff normally eaten in America too, but definitely not on pizza. 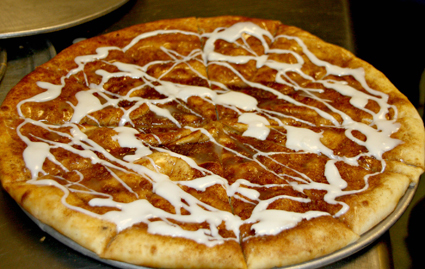 It's also rare to see mayonnaise or other sauces added on top of a pizza in America. Another thing I found interesting is that with a four-cheese pizza here, they'll include a packet of maple syrup. It seems like adding on that would make it more of a dessert than a meal. アボカドソースのピザはアメリカでは見かけません。 / You hardly ever see avocado sauce on top of a pizza in America. 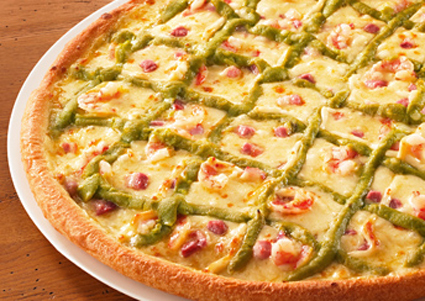 Speaking of fours, it's common in Japan to offer pizzas divided into 4 quadrants with different toppings on each. America has half-and-half pizzas, but it's not as common, and most places won't go to fourths. so being able to have different toppings for everyone is pretty convenient. Usually if you want different toppings in the States you just order more pizzas, haha. こういうのをアメリカでやったら流行ったりするのかなぁ？ / I wonder if this idea would be popular if they offered it in America. 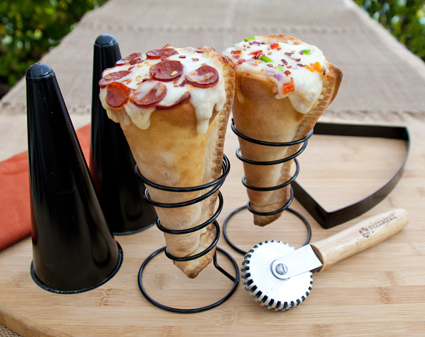 I'm just gonna drop in some images of some atypical pizza styles. 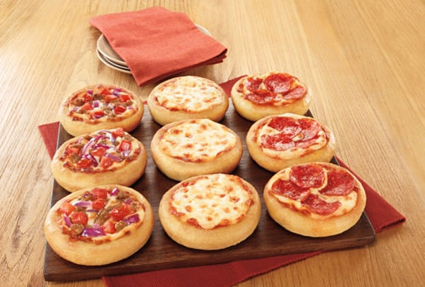 Etc etc, there's tons of pizza styles! Everybody loves pizza! Here's m1dy “Cold Pizza”, a speedcore track. Not really much to do with pizza outside of a sample from a movie, but give it a listen anyway! but if you eat too much you'll gain weight and lose money! Everybody be careful in your pizza-eating habits!